I generally like to do a hard copy of an invite for major occasions and graduation is one of them. It’s not just a card, it’s a keepsake – a photo collage. 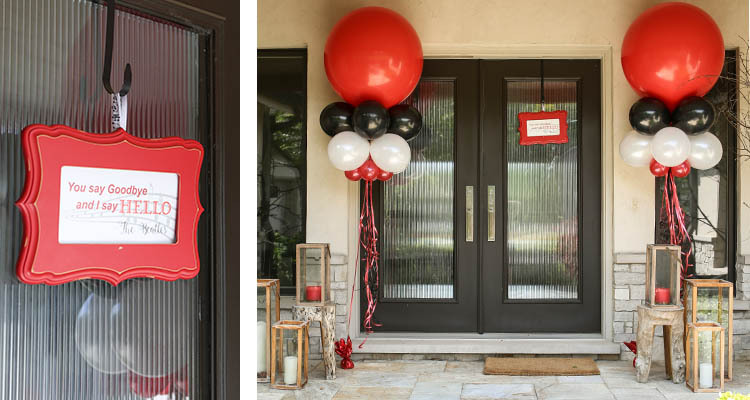 We did a musical themed photo shoot for the invitation images and framed throughout the house. 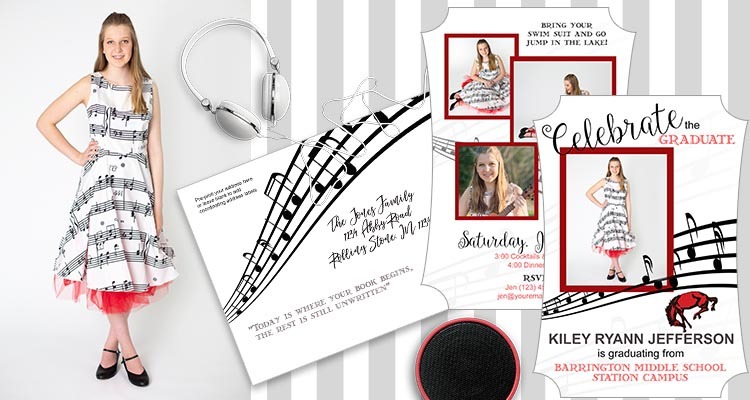 Click here to view musical invitation and envelope. Cards start at $2.05 each. 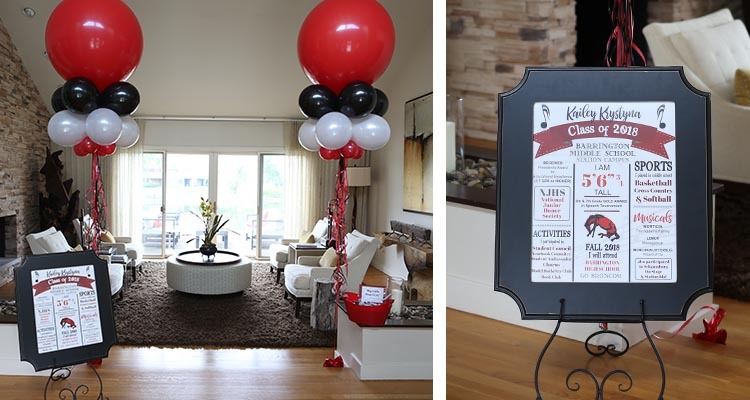 Guests were greeted with giant balloons from All Occasions Balloons – in the Barrington Middle School colors of red and black. 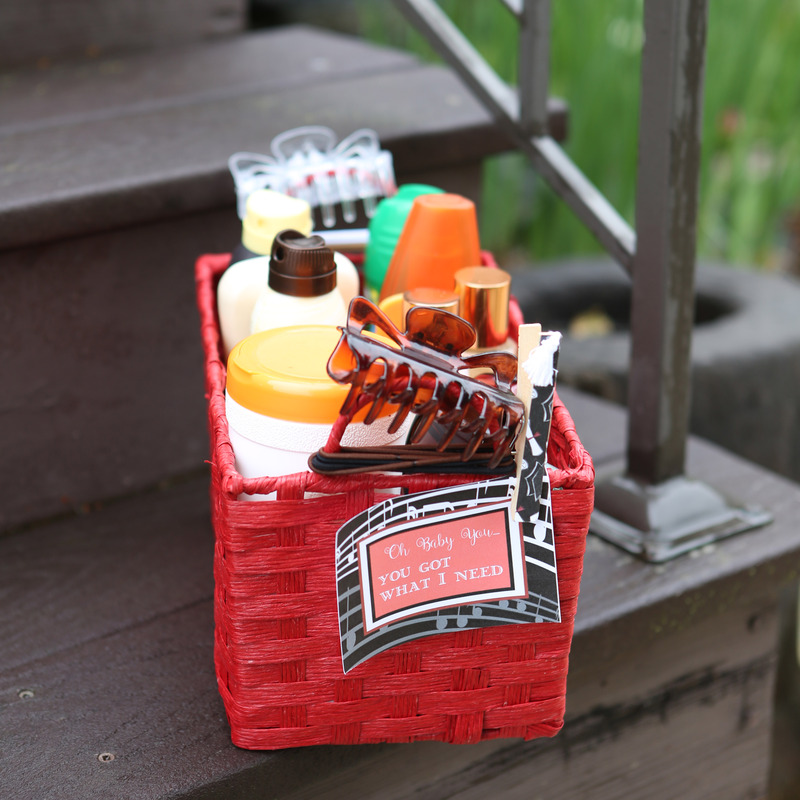 Summer scented red candles by Bath and Body Works gave guests a warm welcome and added a pop of color. The 5×10 welcome sign from The Organic Bloom began the musical theme with the Beatles Quote “You say Goodbye, and I say Hello” as a speaker, hidden behind the planter, played the song on repeat. Printable welcome sign available for download here. The large grand balloons continued as guests walked in and music played throughout the speakers to create a party atmosphere. A 16×20 Graduation Chalk Sign with the Grads accomplishments sat in a frame by The Organic Bloom on an easel. As you walked down the hall, a custom banner displayed the 1st day of school for each year Kindergarten thru 8th Grade. 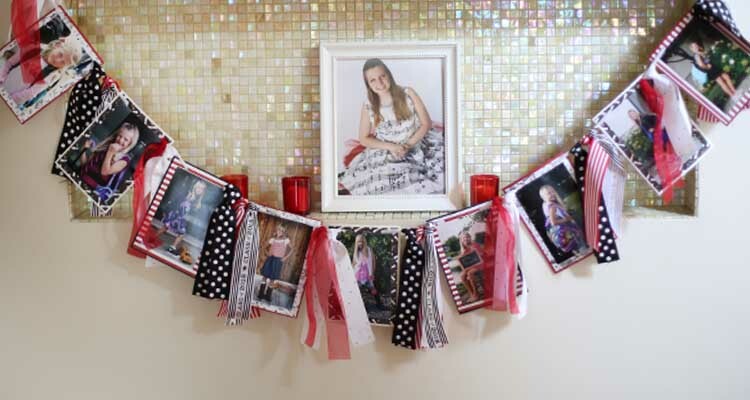 Mini touches throughout the home displayed grad caps and music notes in the school colors. 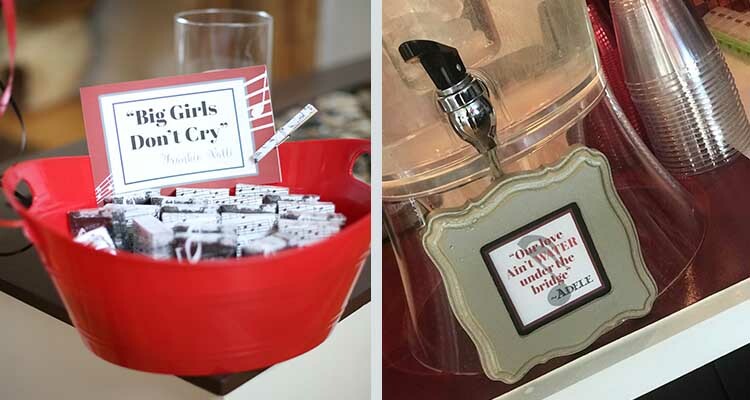 Small signs using song lyrics were created in the theme to guide guests to necessities such as water. The sweet bar was the hit of the party. 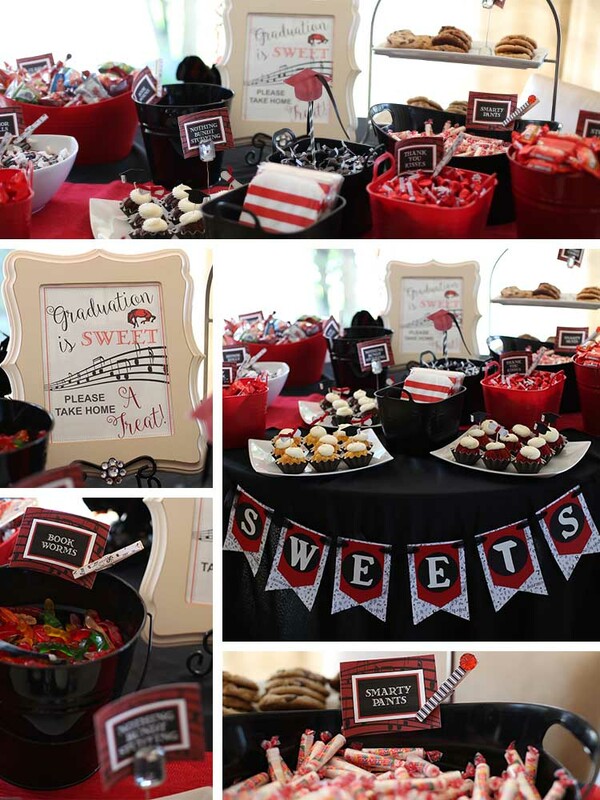 The school-themed candy tags continued the musical red and black theme, while the candies followed the grad theme! A custom music sweet bar sign was displayed in a frame by The Organic Bloom. Nothing Bundt Studying – Mini Buntinis (in school colors!) from Nothing Bundt Cakes. There are NEVER leftovers of these amazing little cakes!! To coordinate with the theme, this box had a tag with the song lyrics “Oh Baby You…You Got What I Need”. There were basic outdoor necessities such as rubber bands, hair clips, wipes, bug spray, sunblock, band-aids, lotion, and scented spray. 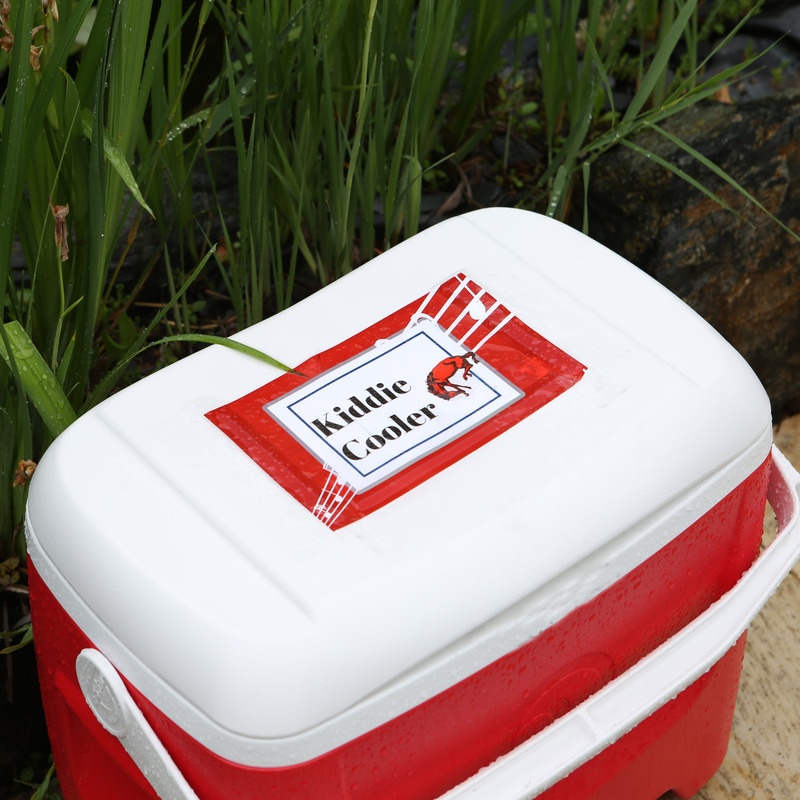 Keep guests from asking “Wheres the Beer?” or opening each cooler to find their option. These cooler labels tell guests what each cooler holds. Add cooler lights (I used coolerbrightz) for night time so you can see what you’re reaching for!! A fun twist on wine charms…colorful “class rings”!